Take the lamb out of the refrigerator an hour before cooking. 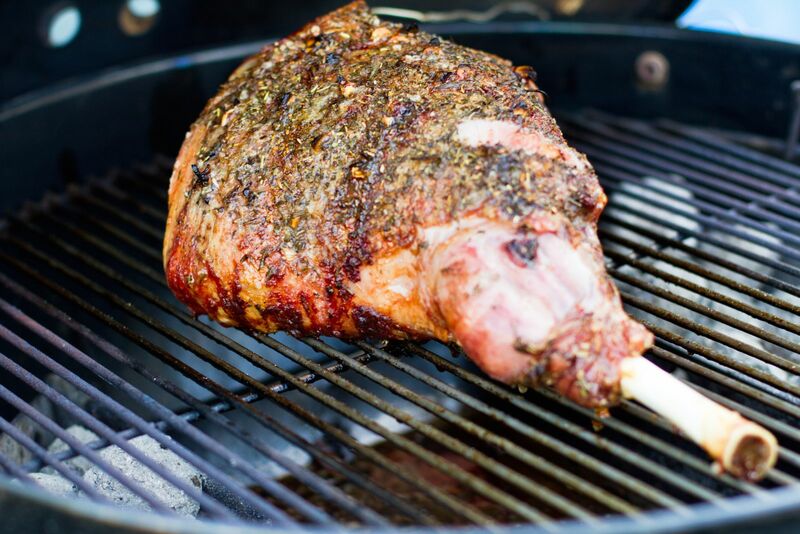 Take the leg of lamb out of the refrigerator about an hour before cooking so it comes to room temperature. This promotes faster, more even cooking. Rub the lamb with olive oil. Set the lamb in a rack inside a roasting pan. Drizzle with olive oil and rub into the fat and meat. Season with salt and pepper. Sprinkle liberally with salt and pepper. Broil for 5 minutes. Turn on the broiler and position a rack below so that the top of the meat is a few inches from the broiler element. Broil the lamb for 5 minutes or until the top of the lamb leg looks seared and browned. Flip the lamb over and broil the other side. Flip the lamb over and put back under the broiler for 5 minutes or until the other side is seared. Top with garlic and rosemary. Take the lamb out of the oven. Turn off the broiler and set the oven temperature to 325°F. Reposition the oven rack to the middle of the oven. Mince the garlic and rosemary leaves. Flip the lamb leg over again and rub the top with the chopped garlic and rosemary. Cover the lamb loosely with foil. Tent the pan loosely with foil to keep the garlic and rosemary from burning. Put the lamb back in the oven and cook at 325°F for one hour. If needed, continue cooking the lamb until done. Continue cooking the lamb (uncovered) until it reaches your preferred internal temperature. Check the temperature every 20 minutes until done. Let the leg of lamb rest. Let the lamb rest for at least 15 minutes before carving. Carve the lamb: Turn the lamb so the bone is parallel to the cutting board. Make perpendicular slices to the bone, angling straight down until your knife hits the bone. Carve the lamb: Cut the lamb off the bone by slicing through the bottom of the slices with your knife parallel to the bone.